Today I would like to share with you a great beginner crochet scarf. When people ask me what to make first for crochet, I recommend a crochet washcloth or a scarf like this one. Speaking of my new video, I have a bunch of crochet tutorials over on my YouTube Channel, but I have been wanting to make one that is truly beginner friendly, like your first project beginner friendly. Almost all of my tutorials are meant to be simple and easy, and beginner friendly but sometimes I get complaints that I’m going too fast or something is confusing. So I decided to make a very slow paced crochet video, perfect for the beginner but with a twist for the more advanced crocheters. Anyway, here it is and I hope you enjoy! 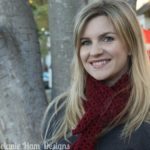 This video shows you how to make a simple beginner crochet scarf. I go very slow so its easy for a beginner to follow along. If you have crocheted a few projects or are comfortable with textured yarn, this is the yarn I used. I used 2 of these skeins for my grey example scarf. Whatever yarn you choose, use the crochet hook recommended on the label – that way you can pick any yarn you like. This project will work with most yarns. Continue placing a dc in each chain all the way down the foundation chain. You should have 26 double crochets. When you reach the end, dc in the 3rd chain from your turning chain to complete the row. You should have 26 double crochets all the way across. Repeat until scarf is desired length. *This contains affiliate links. 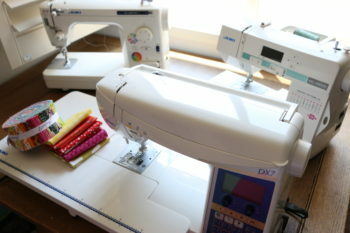 It costs nothing for you, but each small percentage helps keep me in sewing supplies! THANK YOU for the support!! It is 29 for the foundation and then 26 for the open spaces? I keep getting the wrong number. Am I off or is the video off? I keep getting 27 double crochets! I cannot even follow a beginners pattern…lol. ??? 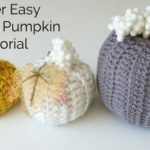 I love your beginner video for the crochet beginner. 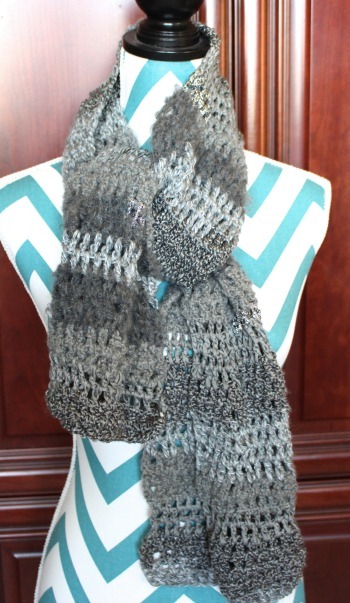 I just loved your specific video of the beautiful textured scarf. I am going to try that project. Hi Melanie. Great scarf pattern! I have npmade several already. I would just like to know what the crochet stitch for this scarf is called?? Thank you! Do you have an easy crochet pattern for prayer shawls? Would you use same pastern you have for pink baby blanket? I love that pattern. Thanks so much for your reply! I want to make prayer shawls for nursing homes. 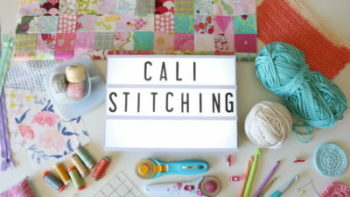 What do u recommend the chaim stitch to be for a toddler scarf? Love your videos! I am a true beginner, and I took this apart several times because I wasn’t getting the count right, but I did get it. Now I need to know how or start the 2 nd skein of yarn to finish it . Showing works better for me than written, but I will try what ever to finish this. I am just so excited that I am finally making something. I am a beginner, and it has taken me a few tries to get this down, I’m hoping I can finish it today. Thank you so much for the video! I just wanted to thank you for all of the tutorials you do. You have inspired me to do more and challenge myself to do different projects. I just finished my scarf and love it. I wish I could post the pic of the scarf! You are awesome! nemajú diskutovať takých témy . Na ďalšie! If we wanted to change the width of the scarf, is there a particular multiple to use — instead of the 29 stitches at the beginning? Thanks – great video (they all are)!! I love this scarf………well oke, all of your crochet works. I love all your tutorials. You are my inspiration to learn do new projects. I especially love your sewing ones. Thanks for being such a positive person and a ray of sunshine for my day! Awe thank you so much! Thanks for stopping by!